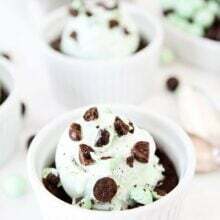 We shared photos from our Summer Outdoor Dinner Party yesterday and today we are sharing the dessert recipe we served at the party-Deep Dish Chocolate Mint Chip Cookies. We are going to share a few more recipes from the party, but I had to start with dessert. Dessert first is always a good idea, especially when cookies and ice cream are involved. When I was shopping for some party items at World Market, I stumbled upon Mint Chocolate Cookie Crisps. I couldn’t pass them by. A few bags made their way into my cart. I knew these candies belonged in a cookie. I chopped up the cookie crisps and loved the contrast of mint green and chocolate. Cookie crisps in a cookie-double the cookie, double the fun! I made a chocolate cookie dough with a little peppermint extract. I added in chocolate chips and the mint cookie crisps. I didn’t want to make plain old cookies. I wanted the dessert for our party to be special, so I pressed the cookie dough into ramekins to create a deep dish cookie. I baked the deep dish cookies until they were set around the edges, but still soft and gooey on the inside. You don’t want to over bake these cookies. We served them warm out of the oven with a scoop of chocolate mint chip ice cream. The cookies were rich, chocolaty, with a refreshing mint kick. I loved the slight crunch the mint cookie crisps added. The chocolate mint ice cream melted into the cookie creating an extraordinary dessert! The table was quite for a few minutes, not because we were sick of talking to each other, but because everyone was having a moment with their dessert. Everyone loved the Deep Dish Chocolate Mint Chip Cookies. Our friends asked if we would be sharing the recipe or if it was a secret. Luckily, we don’t have any secrets, well, at least not recipe secrets:) We are happy to share our recipes! So here you go! We hope you enjoy our Deep Dish Chocolate Mint Chip Cookies. Cookies and ice cream have never tasted so good! 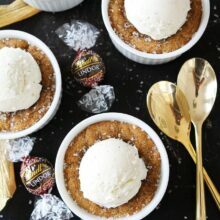 This is a great dessert for serving at parties too because you can make the cookie dough in advance and bake them off when it’s dessert time. Plus, everyone loves having their own special dessert. Make sure you come back, we will be sharing more recipes from our Summer Outdoor Dinner Party this week. Now, go make dessert. 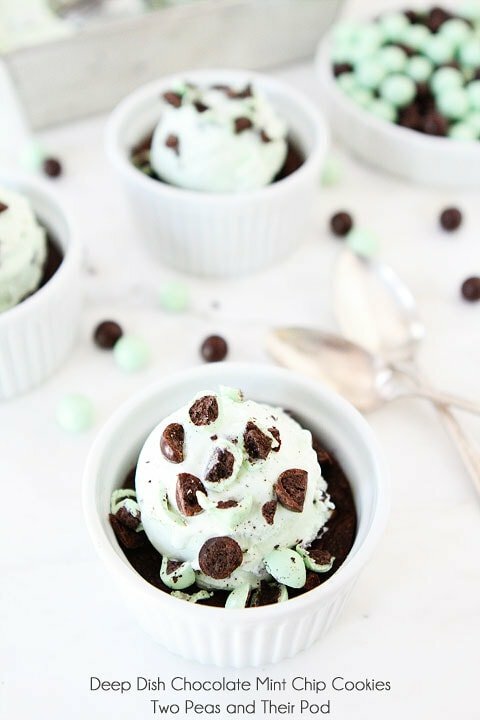 These Deep Dish Chocolate Mint Chip Cookies are calling your name! Happy Summer! Chocolate mint chip cookies served in a ramekin with a scoop of chocolate mint chip ice cream. These individual desserts are perfect for parties or every day dessert! Preheat oven to 350 degrees F. Spray ramekins, 6 ounce size, with cooking spray and set aside. With a mixer, cream butter and sugars together until smooth. Add in eggs, one at a time. Next, add in vanilla extract. Mix until blended. Slowly add flour mixture to sugar mixture and mix until flour disappears. Stir in chocolate chips and mint chocolate cookie crisps. Take a 1/4 cup of cookie dough and press it into a ramekin. Continue with the rest of the dough, or however many deep dish cookies you need. If you don't use all of the dough, you can keep it in the refrigerator for up to 3 days. You can bake normal size cookies off or you can freeze the dough if you wish. Place the ramekins on a large baking sheet and bake for 12-14 minutes, or until the cookies are set around the edges, but still soft in the center. Don't over bake. Remove from oven and let sit on baking sheet for 2-3 minutes. Top with chocolate mint chip ice cream while the cookies are still warm and serve immediately. Note-you can buy the Mint Chocolate Cookie Crisps at any World Market store. You can also buy them online at World Market. If you can't find them, you can use mint chocolate chips instead. New candy finds are always exciting. Couldn’t agree more about a cookie in a cookie. Yes, please! Mmm! This looks so good! Cookies and ice cream is an award winning combo! I have not seen those cookies at Cost Plus, now I must go and search for them! Your deep dish cookies look amazing! I love chocolate mint cookies and the ice cream with it, is so perfect!!! What a delicious treat! 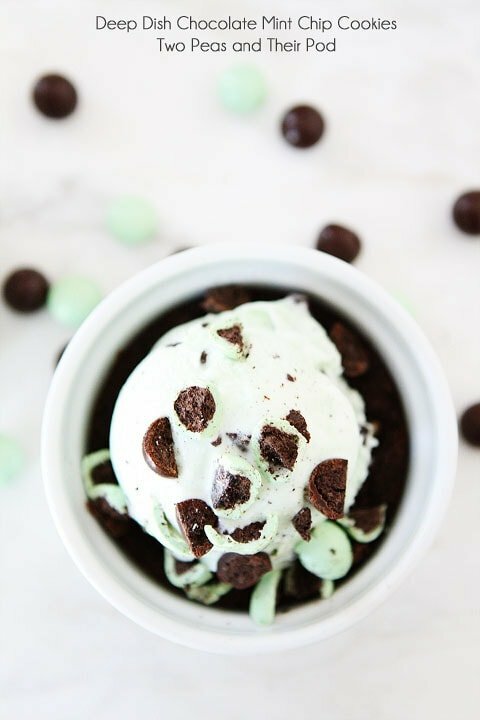 I have always loved mint chocolate chip ice cream, so I’m a fan of any place where mint is combined with chocolate. Perfect! How yummy! I love how refreshing mint is too. And what a find with those candies – they look so tasty! My favorite flavor combo EVER!!! So pretty, too. This is just gorgeous! And what a great idea! My daughter would flip over these because mint chocolate chip is her favorite! Love this idea! Mint is taking over my brain recently – it’s so refreshing! Such a fun find! I wish we had a world market nearby! I’ve never seen those but I feel desperate for them now!! This cant get in my belly fast enough… it looks and sounds AMAZING!!! I am a mint & chocolate freak! It’s my favorite combo. I love that you made these individualized and deep dish. Bookmarking this one! Oh man… these look to die for! These look amazing! I agree; the contrasting colors are lovely! Wow. Mint chocolate chip ice cream is my favorite ice cream ever and the fact that you put it on top of a mint chocolate chip cookie. I can’t even handle the awesomeness of this. Yes and Yes!! Love the green!!! Two of my favorite favors together, and then you took it over the top with cookies AND ice cream!!! Pinned and on the list to make very soon. Is that home made ice cream, and if so, will you be sharing that recipe also? After seeing your dinner party pictures, I sure do wish I lived next door! Thanks for sharing the recipes – I can’t wait to see this week’s posts. I’m positively smitten with these Maria!! 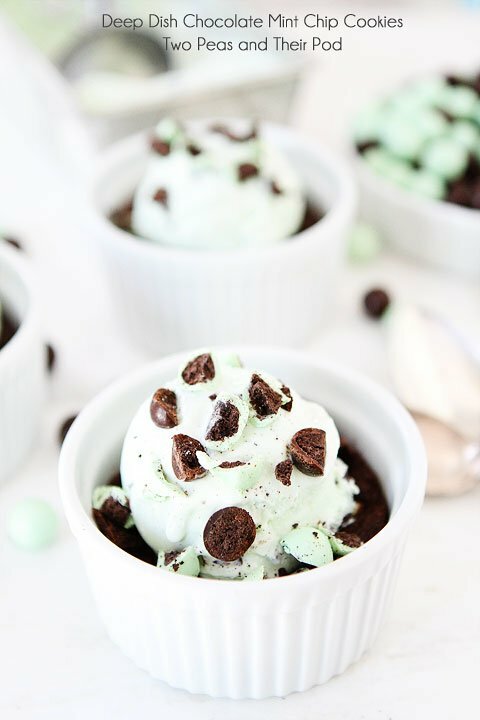 Ben would flip out if I made these for him, his favorite ice cream combo (besides vanilla) is mint chocolate chip! These look fantastic! What a fun idea for a dessert. I love how extra-special they are in individual portions. Chocolate and mint are two of my favorite flavors and I love them combined together. I live 10 minutes away from a World Market (dangerous! )…I’m going to have to try these candies! 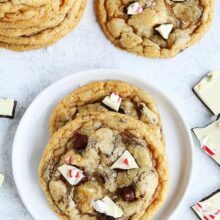 Just wondering if we can make regular drop cookies with this recipe, instead of deep dish? Thanks so much for sharing your yummy recipes! Yes, you can make regular drop cookies with this recipe. Enjoy! Wow! Love these, Maria! I’ve always loved chocolate and mint combo! I’m heading on over to World Market ASAP…I can’t believe I’ve never seen those little cookie crisps. Mint chip ice cream was always my favorite growing up, so this dessert is making my head spin in the best possible way. Cookie dough in ramekins?! That’s the only way to do it man. Well done! Pretty pictures! Chocolate Mint Chip? That’s my favorite, this is going to be great! This is one of my favorite flavor combos- definitely a must make!!! World Market is the food bloggers mecca! I swear between the food props and fun food options, it’s the best place on Earth! Love this dish, Maria! 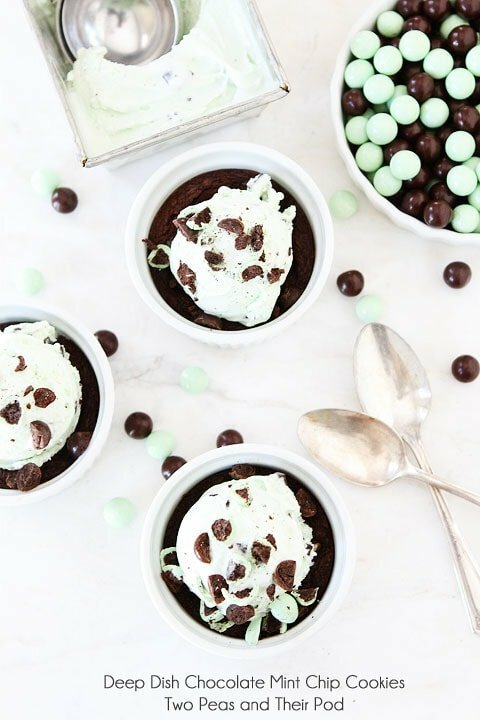 We are HUGE fans of mint chocolate around here! Need these in my summer!! Wow, these look delicious!! Love the thought of deep dish cookies, how clever. 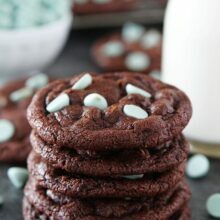 I love chocolate mint desserts, these cookies look fab! I love chocolate and mint together! What a great cookie – I have to keep my eye out for those candies next time I am at World Market. These look absolutely incredible, Maria! 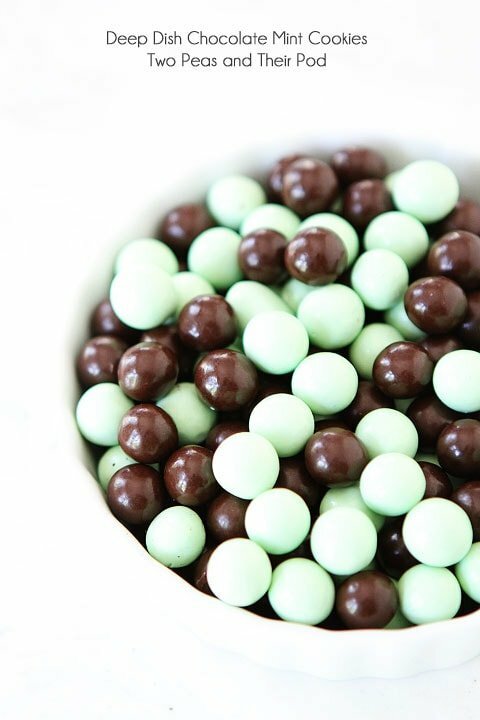 Love that burst of mint paired with chocolate. Yum! What a fun dessert for a summer dinner party. I love this one! This dessert was amazing at the dinner party. Mmmm I’ve got a craving for another. Thanks for posting the recipe. So glad you were able to join us! Let’s get together and bake cookies soon! I could go for a huge handful of those cookie crisps. 🙂 I love finding new candy! Gorgeous pictures Maria! So scrumptious! I love the flavor! How beautiful are these? Pretty darn awesome. I HAVE to find some of those mint chocolate morsels. Yum! And this looks like the perfect summertime dessert. I’ll bet your guests were very excited for dessert! Love this idea for a dinner party! And who doesn’t love the combo of mint and chocolate?! Such a refreshing way to end a meal! Mint chip is one of my faves! I love these! How fantastic is this! I want to be your neighbor so we can have cookie baking competitions, and also so I can eat all these scrumptious things you make. I am so obsessed with these deep dish cookies! A must for us this Summer! Thanks for catching my typo! It’s fixed! I haven’t seen the Cookie Crisps. What a fun dessert for summer. 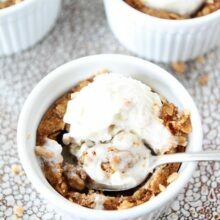 This dessert looks fabulous..love those cookie crisps, so fun!!! Wow these look amazing Maria! This looks DIVINE! I love all things mint and chocolate!!! Thank you for sharing this recipe. Definitely going to be making it very soon!! Is it okay if I pin it? This desert looks SO good! I might have to try this out sometime this summer, although summer is winding down! It just looks like a delicious summer snack or dessert to have! 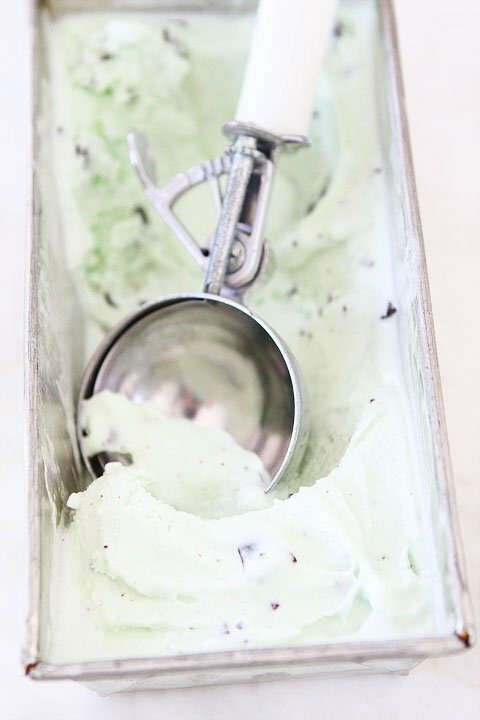 Mint is my absolute favorite kind of ice cream flavor! I am definitely going to save this recipe! 🙂 Thanks! This sounds really good, but the mint cookie crips don’t seem to exist. The link desn’t bring up an item and the stores don’t have them. Oh no, they are so good! I hope they start making them again! If you can’t find them, you can use malted milk balls. 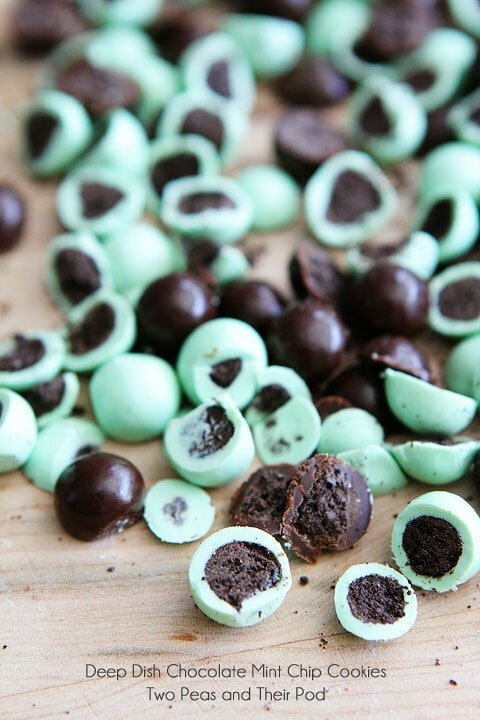 To get more mint flavor you can replace the chocolate chips with mint chocolate chips!